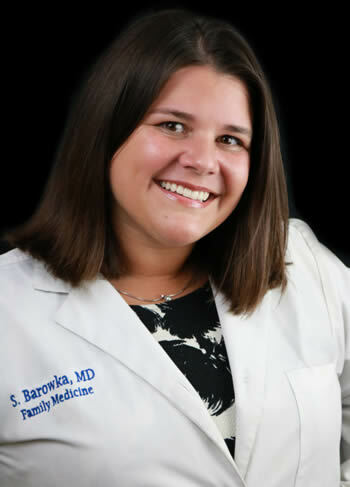 Dr. Sarah Barowka is currently clinical faculty and teaching staff at the North Mississippi Medical Center Family Medicine Residency Center where she cares for patients in the clinic, hospital, acute rehabilitation, and long term care settings. She received her undergraduate degree in neuroscience at Rhodes College in Memphis, TN and received her medical degree from Louisiana State University School of Medicine in New Orleans, LA. She completed her family medicine residency training at NMMC in 2016 and has served as faculty since this time. Dr. Barowka also serves as medical director of NMMC Employee Health, which encompasses over 7000 employees. Dr. Barowka has a love of educating and serves on the Medical Education Committee at NMMC and a co-chair for the Family Medicine update conference and part of the planning committee for the regional NMMC Outcomes conference. She enjoys traveling and photography.